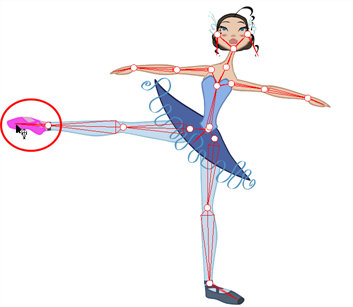 Harmony 11 Workflow Network Documentation: Where to Start with Inverse Kinematics? 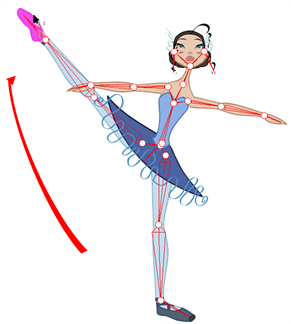 Where to Start with Inverse Kinematics? IK works best when you lock a part of the character on the spot, such as a foot on the floor, then select the entire body or another extremity and move it. It also works well in single chain mode when you need to simply position a limb. Tip: To lock a part in place, use the IK Nail option—see Nails. 1. 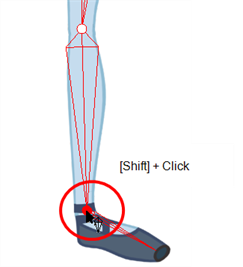 In the Tools toolbar, select the Inverse Kinematics tool or press Shift + I. 2. In the Camera view, Ctrl + click (Windows/Linux) or ⌘ + click (Mac OS X) on a part of the body. The entire IK skeleton appears. 3. Click on a part of the body and pull on it to move the character. 4. Hold down the Shift key and click on the pivot belonging to the part you want to lock in place.You can Shift + click on a bone to lock the orientation of the bone. 5. Click on another part of the character and pull on it.